Under what has been dubbed a “restructuring effort”, Air Seychelles has cut 77% of its total seat capacity. Between Nov-2011 and Mar-2012, the airline will cut all routes except for its domestic services, which includes one scheduled service to Praslin Island and a handful of chartered services operated on behalf of hotels, and its twice weekly service to Mauritius. The carrier in Oct-2011 had a restructuring plan, CEO changes and corporate re-branding, which were intended to result in a renewed focus on high-end tourism, as CAPA wrote at the time. Just two months later, the carrier announced deep capacity cuts, suggesting more drastic measures were needed. 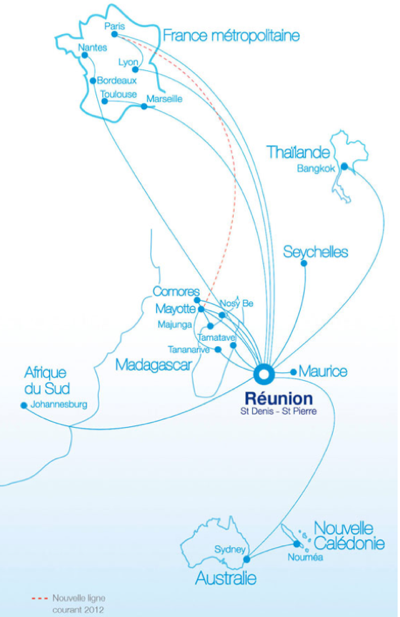 Fellow Vanilla Islands Group (an affiliation of the island nations Seychelles, Madagascar, La Reunion, Mauritius and Comoros that are supposed to work together to promote tourism and investment) carrier Air Austral, based in La Reunion, will also make capacity cuts to its long-haul network although it is looking to Asia Pacific and remains intent on keeping its European services operating. Meanwhile, Air Mauritius recently reported an unexpected net loss in its 2QFY2011 results, Air Madagascar can only operate to the European Union through a charter agreement with EuroAtlantic Airways due to its presence on the EU Airspace blacklist, and Comores Aviation only operates a handful of destinations around the Vanilla Islands Group and Eastern Africa. Overall, future prospects for the group look bleak unless collaboration efforts are taken more seriously. The first route to go was Air Seychelles’ Singapore service, which ended in Nov-2011. Singapore, the carrier’s third failed Asian destination after Chennai and Kuala Lumpur, was supposed to be the gateway to the carrier’s Asian expansion plans. While Air Seychelles maintains it is “identifying new routes to the Far East”, the chance of successful future expansion in this market looks bleak. An Air Seychelles spokesperson told CAPA these new Far East routes are in the “preliminary stages” and that “nothing has been confirmed yet”. The spokesperson added the carrier is unsure whether these possible new services will operate with Air Seychelles aircraft, or through codeshares. “We may possibly look at forming codeshare partners to serve the region,” the spokesperson said. Air Seychelles currently only codeshares with Air France. 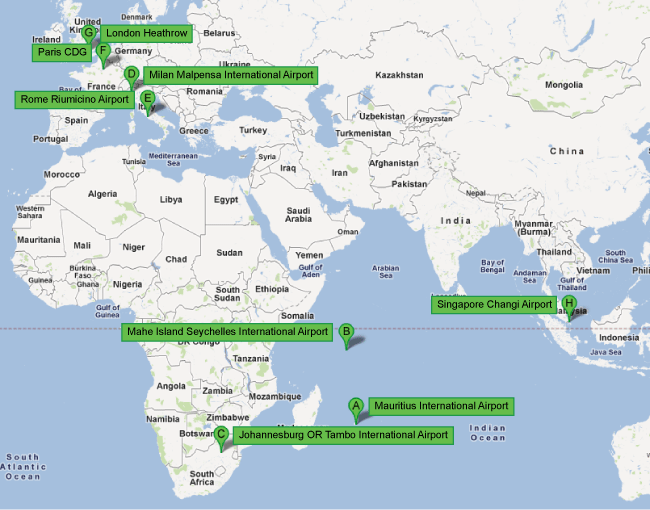 Air Seychelles’ service to London via Rome and Milan will be the next to go on 08-Jan-2012, followed by Paris CDG on 25-Mar-2012 (from 10-Jan-2012 the service will be reduced from five to three times weekly). Service to Johannesburg, the carrier’s only destination on the African continent, will be cut at a future date not yet announced - see Route Changes Table for more information. ... To a network that offers one international service, under 2000kms away. The cuts leaves the island nation disconnected from its key markets, as it is the only carrier to operate service between the Seychelles and Paris CDG, London Heathrow, Rome, Milan, Singapore and Johannesburg. This disconnect opens the opportunity for other carriers, in particular Middle Eastern carriers, to begin service. Emirates has shown a strong interest in Air Seychelles and has offered to hire Air Seychelles' staff who are affected by the job cuts. Emirates is also in frequent talks with the country's tourism ministry about adding services and promoting the destination in the UAE. At the end of Oct-2011 and the start of Nov-2011, Air Seychelles returned its two 767-200s to International Lease Finance Corporation (ILFC) – three years before the expiration of the leases. These aircraft were primarily used for a contract with the UK Ministry of Defence to provide charter services from the UK to an air base on the Falkland Island. The carrier lost this contract in Sep-2011. The aim of returning the aircraft early was to “right-size” its fleet, according to CEO Bram Steller. Air Seychelles now operates three DHC-6 Twin Otters, one Shorts 360-300 and three 767-300ERs, which were used for scheduled passenger service to destinations in Europe. When the carrier's European services end the aircraft will reportedly be returned to lessor ILFC. A spokesperson from Air Seychelles confirmed to CAPA the carrier decided earlier in 2011 to not take delivery of two ILFC-leased 787-8s. Air Seychelles ordered the aircraft in May-2006. The Seychelles market is much more open than that of its neighbour, Mauritius, with the Seychelles Government allowing international carriers to operate at capacity close to Air Seychelles. The second largest carrier in the country, Emirates, offers 5600 seats per week while Air Seychelles offers 8500. Once Air Seychelles concludes its network trimming, it will shift from being the largest carrier in the Seychelles to the fifth largest. Qatar Airways, Etihad Airways, Ethiopian Airlines, Condor Flugdienst, Kenya Airways and Air Austral all operate in the market with a combined capacity of approximately 4700 seats per week. Etihad entered the market on 02-Nov-2011 with a four times weekly service. Ethiopian Airlines had planned to launch service on 15-Nov-2011, however delayed this due to “operational reasons” and recently confirmed a new start date of 22-Jan-2012. While Air Seychelles has cut capacity other carriers have increased capacity. Emirates increased weekly capacity from 5160 seats per week to 5676, following the introduction of an additional frequency to make the service 17 times weekly, according to Innovata schedules data. 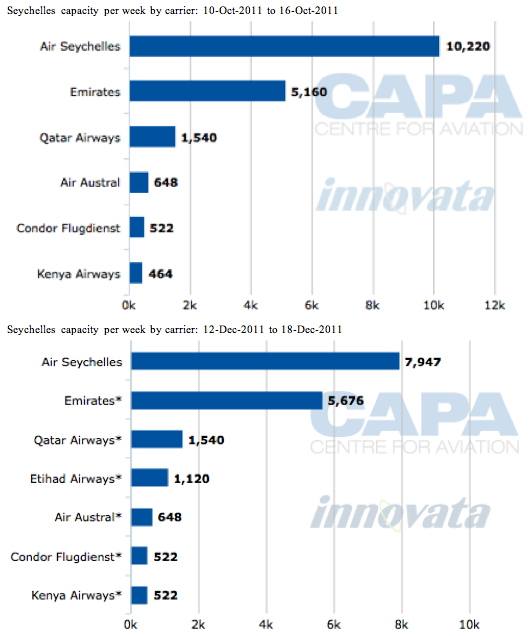 Emirates has planned further capacity increases and on 25-Mar-2012 plans to add another four frequencies. It is difficult for these small, end-of-the-line carriers to compete with the Middle Eastern airlines and their large, ideally located hubs that can transport passengers anywhere in the world through one transit point. Emirates plans to further its reach into the Vanilla Islands and recently concluded a visit to Madagascar to study the feasibility of launching services there. VP of sales and marketing for Asia and the Indian Ocean, Sheik Majid Al Mualla, told L'Express de Madagascar, "I'm here to contact the authorities and see firsthand the state of infrastructure and explore opportunities to open a line to serve the Big Island". The developments mean Air Madagascar, who recently confirmed it will take delivery of either an A340 or B777 aircraft in Mar-2012, may see a similar fate to Air Seychelles if cooperation between all the Vanilla Islands members is not improved. Meanwhile, 2000kms south of the Seychelles, La Reunion’s national carrier, Air Austral, is planning to take a similar approach to some destinations in its long-haul network. The carrier confirmed pans to implement a three-year business plan, which will include route cuts. Air Seychelles reported a loss of EUR23.9 million in the six months ended 30-Sep-2011 (1HFY2012), compared to a loss of EUR1.9 million in the 2010 period. 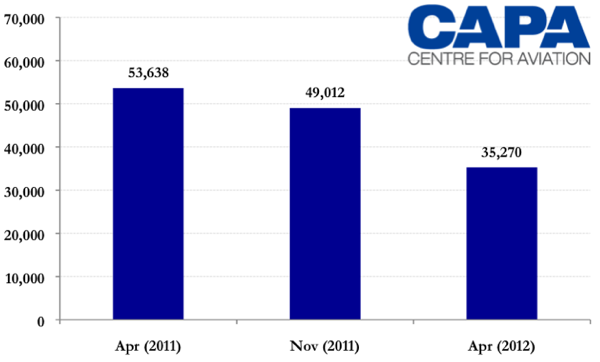 The carrier expects to report losses of EUR27 million in the period ending 31-Mar-2012. As part of its business plan the carrier has frozen all wage increases, however maintains it will make no staff cuts. Air Austral confirmed it will suspend its service to Bangkok (which was reduced to twice weekly on 30-Oct-2011) and Sydney-Noumea on 26-Mar-2012 and 20-Mar-2012 respectively. The services can no longer be booked through Air Austral's online reservation system from the above dates onwards. The aircraft used on these routes (777-200/200ER and 777-300ER) will be re-deployed on French services including Marseille, Lyon and Paris CDG. Air Austral recently confirmed it will operate a new Saint Denis-Seychelles-Paris CDG for Air Seychelles when it suspends the route. Air Austral has already opened reservations for the service, which will operate twice weekly with 777-300ER equipment from 27-Mar-2012. Air Austral's purchase of A380s will proceed as planned, pending the approval of further financing for the aircraft and future route development. The carrier's two A380s are expected to be delivered in 2014, and one B777-200LR is expected to be delivered in 2012. Air Mauritius recently reported a net loss of EUR6.3 million in its usually profitable 2QFY2012 period, citing rising oil prices, poor consumer confidence and the European debt crisis. The conditions have forced the carrier to review its business model. While this hasn’t yet resulted in any major capacity cuts, it has seen the carrier look at emerging markets more closely. The airline plans to add an extra frequency to its three times weekly Mumbai service in Mar-2012. This is on the back of improving trade relations, which has seen India become Mauritius' second largest import partner, and second largest trade partner overall. Trade between the two countries surged 13.5% from 2009 to 2010, to EUR5.6 billion for the year. Mauritius imported EUR5.5 billion worth of goods from India in 2010, an increase of 18.9% from 2009’s levels. 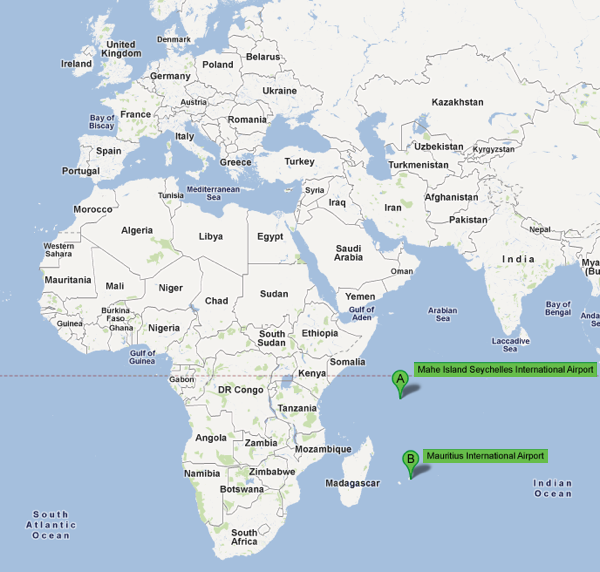 Aside from the European Union, India is Mauritius’ fastest growing trade market. The carrier also hopes to make its Shanghai service a non-stop one in Feb-2012 (it currently operates via Kuala Lumpur) and make it twice weekly in Oct-2012, if demand persists. Kuala Lumpur has the potential to become a much stronger market for Air Mauritius, considering Mauritius and Malaysia's strong historical, cultural and trade ties. Both countries were governed by both Dutch and British rulers and gained their independence in the second half of the twentieth century. In terms of populations, both countries have large communities of Chinese and Indian ethnic groups. Islam, Hinduism and Christianity are significant religions in both countries. The two countries also share a tax treaty and visa agreement in which Mauritian citizens are not required to obtain a visa to enter Malaysia and vice versa, with a similar agreement between Mauritius and Malaysia. Air Mauritius has been attempting to establish Kuala Lumpur International Airport as a hub for future expansion for some months now. The carrier operates all its Asian services through Kuala Lumpur (excluding Hong Kong and Indian destinations), but, further progress in hub establishment has been slow. The carrier is also focused on increasing its high yielding tourism and is eager to see increase business class passengers at Sir Seewoosagur Ramgoolam International Airport. The carrier expects corporate travel to the island nation to increase 90% by the end of 2013. Air Mauritius transported 1500 corporate travellers between Apr-2010 and Mar-2011 and expects this to increase by 38% to 2100 by Mar-2012, then to 4000 by Apr-2013. The outlook for these carriers is uncertain. Due to their heavy dependence on Europe they have been severely impacted by the economic crisis across the continent, and their attempts to shift focus to markets in Asia has proven to be too little, too late. 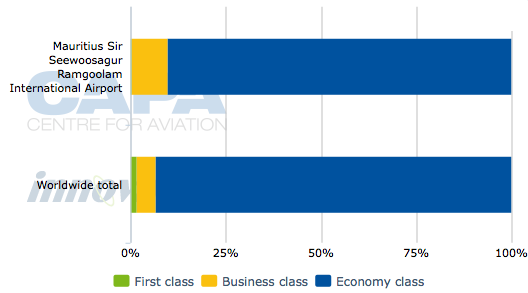 Air Seychelles and Air Mauritius are government-owned, and have been taking advantage of a few bailouts, so their future remains slightly more secure than privately owned Air Austral’s. In Nov-2009, Air Seychelles secured SCR30 million (USD2 million) from the Seychelles Government and in mid-2010, another SCR33 million (USD2.5 million) to help fund the acquisition of a Twin Otter aircraft (valued at SCR60 million (USD4.6 million)). Air Mauritius received a bridging loan from the Mauritian Government of EUR40 million (USD52.8 million) (although it had reportedly requested EUR50 million (USD66.0 million)) to handle the day-to-day operational costs it incurs and pay of debts. The struggle has been intensified by the ramp up of capacity by Middle Eastern carriers. While this did wonders for tourism, the impact on the national airlines of these countries has been detrimental. Air Seychelles, Air Mauritius and Air Austral have been unable to cope with competition from Middle Eastern giants such as Emirates and Etihad, that can consolidate traffic from key traditional and emerging source markets from points across their networks over their powerful hubs. Tourism, which is likely to take a small hit from the capacity reductions, is the lifeblood of these countries. The industry employs approximately 30% of the Vanilla Islands Group’s population, and is an important revenue generator for each country. Air Seychelles, the Seychelles Government and the Seychelles Tourism Board have formed a close relationship with Emirates to ensure the Middle Eastern carrier continues to bring in visitors even when the national carrier can no longer. An improvement in the economic conditions in Europe may lead to an improvement in these carriers’ financial performance and could put expansion plans back on track. Realistically however, Middle Eastern carriers will continue to grow and expand in their markets, making it extremely difficult for the Vanilla Islands carriers to regain their previous standing, should that happen. It is possible Air Seychelles will consider moving to an inter-island model where it only operates charters services for hotels and tourism, as it does already. Greater cooperation between the Vanilla Islands members is crucial to the survival of these carriers. So far, the islands have only worked on a few tourism campaigns and offers discounts for tourists who purchase "twin or three island packages". True cooperation is needed to ensure each country will not let their desire to have their own national carrier hinder recovery efforts. Air Austral's offer to operate Air Seychelles' Paris service is the first major sign of cooperation, which indicates the carriers, if they collaborate effectively, could still have a chance of survival.